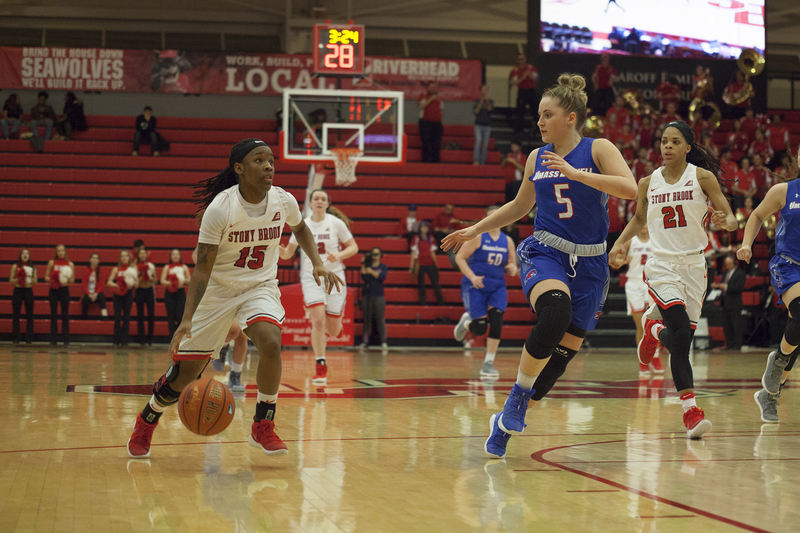 Stony Brook Women’s Basketball rebounded from a tough last-second loss against New Hampshire by defeating UMass Lowell 59-50 Wednesday night at Island Federal Credit Union Arena. With the victory, the Seawolves are now 9-0 against the River Hawks since moving to Division I. Junior guards Jerell Matthews and Shania Johnson continued to lead the Seawolves in scoring, combining for 30 total points in the game. Matthews led the team with 17 points, shooting 50 percent from the field while Johnson finished with 13 points, a team-high seven assists and two steals. Rebounding also played a significant role in the Seawolves’ win, especially on offense. While Stony Brook only managed to out-rebound UMass Lowell defensively 24 rebounds to 22, the Seawolves out-rebounded the River Hawks by 14 on offense, leading to 11 secondhand points. Junior forward Cheyenne Clark recorded 16 of the 45 Stony Brook rebounds, her second-highest rebounding total of the season. This brings her to 190 total rebounds this season, which is the third-highest in the America East Conference. Stony Brook struggled to keep possession of the ball starting off the game, finishing with seven turnovers by the end of the first quarter, including one which led to a wide open buzzer-beater from UMass Lowell freshman guard Paula Lopez to put the River Hawks up 13-10. The Seawolves defense also had difficulty stopping senior forward Kayla Gibbs inside the paint, allowing her to score six points in the paint in the first half and lead her team with 21 points. After trailing 23-18 at halftime, the Seawolves rallied back to tie the game at 34-34 in the third quarter off a layup from Matthews. She later connected on an open shot from downtown to put Stony Brook up 45-40, with 6:25 left in the game, and give the team a lead it would not surrender. With the win, Stony Brook now has an overall record of 11-9 and are 3-4 in America East action. The team will look to go .500 in the conference when they travel to Albany to face the America East-leading Great Danes (18-3; 7-1 AE) at the SEFUC Arena on Saturday, Jan. 27 at 2 p.m.